6.50pm: Evening Standard reporting that the Ministry of Justice is denying that Lewis was ever a magistrate. BBC expecting "major announcement". 7pm: Ray Lewis has just told a press conference that he is stepping down with immediate effect because the "drip-drip" of "unfounded allegations" was damaging the mayoralty. He said the media was "like an impatient schoolchild" that "can't understand the concept of delayed gratification". Regarding the Justice of the Peace issue he criticised "fully-paid up members of the hair-splitting convention" saying that he had been recommended for the role. He thanked Boris, who he had "grown to know, love and admire", for giving him "the opportunity to serve London in this way". Ray sounded bullish but his statement had an air of finality about it. "I believe that my deputy Mayor Ray Lewis is being made to suffer now because he has had the guts to serve in this administration and because he has had the courage to speak out against a stifling orthodoxy that has failed too many of our children." "I'm not a saint. I speak my mind and sometimes I rub people up the wrong way. But I am not the person painted by these allegations. I have never harassed anyone. I have never defrauded anyone. I am happy to face questioning and investigation on all these charges. Being Deputy Mayor of London is the greatest honour of my life and I will not allow that office – or Boris' trust in me – to be tainted in any way. I look forward to drawing a line under this episode, so that I can get on with working to improve the lives of young people in this city. The one thing that is clear is that the left-leaning media have jumped on this story with relish, pre-judging him with little more than some disjointed insinuations. The Guardian, which gave EYLA an award last year, has even teamed up with Channel 4 to launch their own investigation. Winner: Eric Pickles. He has done an enormous amount over many years to nurture Conservative talent in local government. The Tories ran a superb elections night operation and Eric was at the heart of it (with his chief of staff, Andrew Griffiths). His interview on yesterday's Today programme and this morning's Week in Westminster were masterful performances. The party has a new star in Mr Pickles (see him in our behind-the-scenes photos from Thursday night). Winner: The blogosphere. The blogs provided the best coverage throughout election night. Iain Dale's blogging was at its best - funny, informative, fast. Mike Smithson's Political Betting had the best insights to the polls throughout the campaign. And, if we may say so, we were quite pleased at the vindication of us 'calling it for Boris' on Thursday night at 9.59pm. The last two days have been massive for us with 95,386 hits yesterday. We normally get between 20,000 on a normal day and 30,000 on a good day. But if you think we're being cocky, see (12) below. Loser: Michael Portillo. He dissed the Tory performance throughout BBC's elections night coverage and suggested 44% wasn't enough. Iain Dale represented all of us in this video clip when he wondered if Michael Portillo would ever be satisfied at any Tory performance. Winner: YouGov. All of its six polls pointed to a Boris Johnson victory. All other pollsters said it was 'too close to call' or that Ken Livingstone was likely to win. Election after election YouGov have proven that the critics of internet polling are wrong. If YouGov hadn't have been polling we may have seen a different dynamic to the London race with less belief in Boris' credibility and more confidence inside Linvingstone's lair. (We should declare at this point that ConservativeHome is owned by Stephan Shakespeare, founder of YouGov). Loser: The Livingstone-friendly, low circulation London newspapers that received lots of adverts from the Livingstone empire. Boris must review where London taxpayers' money goes. Far too much money is spent going to factional newspapers that depend on public subsidy - delivered indirectly by mass advertising. Winner: The London Evening Standard. It led the exposure of Ken Livingstone's cronyism. Boris Johnson's victory owes much to the courage of Veronica Wadley and Andrew Gilligan. Although in an intensely competitive environment it is suffering circulation decline, the Standard showed that it still matters. It also deserves credit for commissioning the six YouGov polls. Loser: Simon Heffer. His attack on Boris Johnson on Wednesday was mean-spirited and only likely to serve Ken Livingstone. The Livingstone campaign rushed out key quotations from his piece to all London news agencies. When confronting him for Telegraph TV, Liz Hunt accused Mr Heffer of being motivated by jealousy. Johnson didn't deserve the poison pen treatment from the man who actually wrote the anti-Liverpool editorial in The Spectator that caused Boris such difficulty a few years ago. Winner: The Tory activist. How long have we all waited for a night like Thursday night? But it didn't come easy. On Thursday night we won the Edgbaston ward in Birmingham with 60% of the vote. Years ago when activists like Guy Hordern were contesting it, it was just beyond our reach. But it was hardworkers like Guy that ensured the Tory flame never expired in urban Britain. They kept contesting seats, fundraising, door-knocking and now with Tories leading Birmingham - with the LibDems - the party's recovery is built on the foundations of the activists who never gave up in the leaner times. Guy now plays an important role in building good relations between Birmingham Conservatives and the city's voluntary and faith communities. Loser: Islamic extremism. As Paul Goodman MP writes for us today: Livingstone gave comfort to the most extreme voices within Islam. Thursday night - with bad results for Livingstone, Galloway and Respect - London restored its full international standing. Winner: CoverItLive. The chatroom software we used throughout election day and which was taken up by Guido, Slugger and other bloggers. We're going to be doing much more with CoverItLive and please get in touch with us if you'd be willing to help moderate chatrooming lots more events. We're hoping to set up a chatroom for every edition of BBC1's Question Time, for example, carrying on through This Week with Andrew Neil. Loser: Hares. Some of us have wanted the party to be bolder. Bolder on the economy, bolder on social justice, bolder in foreign policy. With Labour collapsing, and the Tories looking so electorally strong the case for boldness is going to have to be made with greater skill - a task we'll be returning to in the week beginning 12th May with a series of features. Tomorrow we'll be listing the people behind Campaign Boris that deserve a free drink or two when you bump into them next. When was the last time the Tories had such a good night? Winning London. Ousting Ken Livingstone - something never achieved by Margaret Thatcher or Tony Blair. Holding as many councils in Wales as Labour. Winning Bury in the North West and North Tyneside in the NE. 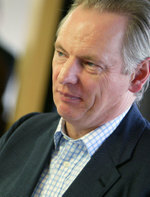 Winning Southampton - an achievement that elections specialist Michael Thrasher said was beyond the reach of any party. More than 300 extra councillors - three times as many gains as the LibDems. A 44% share of the national vote. Not only Labour defeated but clueless as to how they might recover. A majority of Westminster insiders now (for the first time) predicting Tory victory at the next General Election. There's still a lot of work to do over the next two years but 1st May 2008 was a great night for the Conservatives. When was the last time we had such a good night? Sixteen years ago - 1992? Our last General Election victory - won against all the odds with more than 13 14 million votes. Twenty-five years ago - 1983? Our best ever General Election victory in modern times when Thatcherism triumphed and the defeat of Michael Foot began the modernisation of the Labour Party? Hat tip to News Biscuit graphic for the image above. 12.46am: ConservativeHome doesn't share Boris Johnson's generous assessment of Ken Livingstone although we respect Boris for being kind in victory. As Mayor, Ken Livingstone cuddled up to some of the world's most odious dictators - including Chavez and Castro - and also invited Islamic extremists to London - notably Yusuf al-Qaradawi. 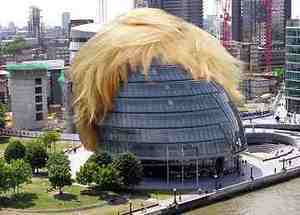 He was an embarrassment to London and we are delighted he is no longer the Mayor of our capital city. Muslim supremacists have lost their greatest western political ally. Over on the Platform, Paul Goodman MP looks at how Muslim extremists attempted to keep Livingstone in office and how moderate, mainstream Muslims are increasingly playing a role in the Conservative Party. 12.06am: Mainstream candidates left the stage when BNP's Barnbrook starts to speak. Midnight: Ken Livingstone makes emotional speech. Promises to help new administration. Wins standing ovation. 11.58pm: Boris makes VERY generous tribute to Ken Livingstone and hopes that he will continue to serve London in some way. Ends speech by saying... Let's get cracking tomorrow and have a drink tonight. 11.45pm: Sky reporting that Boris leads 43% to 37% on first preferences. Polling stations are now closing... Based on a wide range of conversations we've had throughout the day with people in the field and with senior Tory and other insiders we are very confident that on the basis of patterns of turnout, postal votes and canvass returns Boris Johnson has been elected Mayor of London. 18DoughtyStreet.com has launched its third weekly attack ad this morning and it's the hardest-hitting so far. Watch it here and then please forward the link to friends. Iain Dale has suggested that Nick Ferrari would walk the London mayoral race if he threw his hat into the Tory primary race (which Francis Maude described on this site on Monday). Other possible candidates include Boris Johnson, Victoria Borwick, Angie Bray, Nicholas Boles and Steve Norris. The clipping on the right (click to enlarge) from a recent edition of the London Evening Standard says that Mr Norris is unlikely to run again. ConservativeHome disagrees with this assessment and expects the two times candidate to have a third go at defeating Red Ken. "In September 1989 he was appointed to enquire into breaches of security by the Security Forces in Northern Ireland known as the ‘Stevens Enquiry’. It resulted in 43 convictions and over 800 years imprisonment for those convicted." [Taken from his Met biog]. He helped achieve a record 42% reduction in crime whilst Chief Constable of Northumbria from 1991 to 1996. He is a big supporter of neighbourhood policing. He described David Blunkett as a "lying, backstabbing bully." He recently used his News of the World column to endorse the death penalty for cop killers. During his time as London's top policeman the Met invested huge energies in building better relations with London's ethnic minority and gay communities. Little is known of this committed Christian's other political views. Does he support the congestion charge? What does he think of the tax burden on London? How would he achieve a greener London? What other big names would you like to see enter the race? "Avid Conservativehome participants will know that we’re planning to open up the selection process for our candidate to run for Mayor of London in 2008. Everyone on the electoral register in London will be able to have a say over who will be the Conservative candidate to challenge Ken Livingstone for the capital’s top job. And every Londoner who supports the Conservative Party has the chance to be our candidate. We already have the loyal support of our membership, which is essential for any political party, and was absolutely key to our recent local election success. But now we need to reach out to the wider electorate and get new people involved in politics. This is the very first time in British politics that such an important post has been chosen like this. By doing things differently, Conservatives will get people talking about politics again and encourage them to get involved. We need to tackle the disillusionment and mistrust that the public has in politics, and doing something truly innovative like this is the best way of getting people engaged again. The Mayor’s decisions have a huge impact on the lives of everyone who lives in the city, so it makes sense to give everybody the opportunity to have a say in choosing who they think is best suited to the task. The process will be complete by early December, giving our candidate eighteen months to campaign for the job. And having been chosen by Londoners at large, that candidate will start with a huge advantage. We’ve thought very carefully about the details of the process. We’re inviting applications over the rest of the summer, with a panel – not just Conservatives - interviewing to draw up a shortlist by Party Conference time. The shortlisted candidates will then campaign through London over the next two months, with a number of hustings meetings spread around the metropolis and suburbs. If you think you have the skills for London's top job, please do consider applying. You can find the details here." You know that ConservativeHome has long been an advocate of open primary elections and I would like, therefore, to enthusiastically welcome the news that you are planning to select the next Conservative candidate for London Mayor by this open and inclusive method. It’s a great idea but it’s also too good an idea to rush. I hope that the schedule leaked to the blogger Watlington is very much a draft schedule. I think there are many good reasons for waiting a little longer before opening nominations and then to spend a little longer testing the nominees. So many great initiatives announced by the Tories in recent years have been botched. We haven’t looked professional when being professional is one of the most important things an opposition party can deliver. Another botched episode could suggest to the more sceptical voters that we may not be ready for government. 1. Active consultation of Tory members: There will be a lot of scepticism amongst Tory members about this bold idea. Spending a bit of time explaining the advantages of an open primary election to members would be useful. The Party Board – which should not be a rubber stamp in agreeing this idea – could consult members on the design of the election process. In order, for example, for members to have a special role in the process they could play a role in sifting nominations down to a manageable number before the wider London electorate is given the opportunity to vote. 2. Absorb the lessons of the London borough elections: The schedule leaked to Watlington suggested that nominations could open at the end of May with hustings beginning weeks later. The leak could, of course, be false. I hope so. Opening nominations so soon after London’s borough elections would be unhelpful. There’ll be no time to digest the lessons of those results and our councillors will be so absorbed in forming new majority administrations (let’s hope! ), and absorbing new council members, that they won’t be able to be as involved in the nomination process as they deserve to be. Next month is the worst possible time to distract our councillors – some of whom may want to play active and advisory roles in the Mayoral selection process. 3. Headhunt some Mayoral candidates: The Conservative Party is rightly spending time headhunting candidates for parliamentary seats. We should spend some time encouraging people to be involved in the race for London Mayor. Opening nominations at the end of May and rushing into hustings will stop such a process happening. "The intention is that the contest will begin with candidates applying at the end of May. The next stage will be a series of Primaries in which members of the public who register as Conservative supporters will be able to attend and have voting rights. Throughout June and July there will be a series of "rolling hustings" with the first ballot taking place some time in September, with a second ballot taking place in the same month if no candidate gets over 50%. Voting will either be by text or on the Internet. The cost of the Primaries is expected to reach close to £500,000 but it is hoped that this will be recouped through donations and possibly charging people to vote by text." Holding the election over the summer will make it difficult for many holidaying Tories to participate. "It is understood that candidates are expected to be asked to guarantee to raise their own money for the election campaign against Livingstone (expected to cost between £1 and £2 million). This means that the only candidates who can stand are either very rich or have very rich friends." "Critics of these proposals believe that the reason that the selection process is being rushed through is to favour potential moderniser candidates. It is hoped that if there is a quick contest, then other strong candidates from different sections of the party will not have time to gather the necessary forces to win." Editor's comment: "ConservativeHome has long been a supporter of open primary elections. They are an exciting way of introducing new people to the Conservative Party and they are a way of recognising that the age of mass membership political parties is being replaced by an age of mass connections politics. Giving Londoners a decisive say in the Tory candidate for Mayor will reconnect the party with tens of thousands of people and could be a huge source of new revenue. ConservativeHome is concerned about the timetable, however. It appears far too rushed. The Party Board - which has yet to approve the plan - should ensure there is more time for alternative candidates to emerge. Watlington mentions a number of possible runners and riders and some of the more promising candidates probably need more time to challenge the likes of Steve Norris. June and July is too soon for hustings to take place. An election early next year would still give the chosen candidate a full year to oppose Mayor Livingstone."